If you’re searching for OEM INFINITI parts and accessories, come speak with the experts at Cochran INFINITI Gallery of North Hills. We have a wide range of genuine INFINITI parts in stock, or we can help you order new INFINITI parts online to have them shipped right away. No matter what you need, our INFINITI dealership in Wexford, PA, is your top resource for new INFINITI accessories and authentic INFINITI parts in the Greater Pittsburgh area. View our new INFINITI parts specials or check out the new INFINITI accessories for sale at #1 Cochran to enjoy special savings on car parts you need. 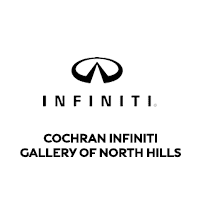 Whether you want to customize your INFINITI vehicle or you need to replace old INFINITI parts, you can talk with the experts at Cochran INFINITI Gallery of North Hills for tips and tricks. From new INFINITI tires to authentic INFINITI accessories, we have it all!